A Success Story – Elouise Miller | Service Coordination, Inc.
Elouise Miller is a 63-year-old, lifelong resident of Baltimore City. She is kind and personable. Elouise has a close relationship with her family. Elouise has three sons and one daughter who all live in Baltimore City. She is married and lives with her husband. Some of her hobbies include, cooking, making jewelry, and creating gift baskets. Elouise is an accomplished hostess and has enjoyed creating welcoming events for her friends and family to share. Before Elouise became ill in 2005, she loved to work outside of her home. Elouise was a homecare provider and provided care to others for many years. About thirteen years ago, Elouise began to show signs of memory loss and was later diagnosed with schizophrenia. In 2005, she experienced high blood pressure and had dizzy spells. She struggled in the following year and in 2006, her health had declined to a point where she had to apply for disability. Elouise’s family became concerned and worked together to intervene, offering help to ensure she remained as healthy and safe as possible. Unfortunately, Elouise’s conditions worsened and the family was overwhelmed with the high level of involvement of her care. Some of the aspects of the care that she needed assistance with included help with getting dressed, as well as safely preparing meals. There was a serious concern that Elouise was not able to cook meals safely as she would forget to turn the gas stove off when she was done cooking a meal for herself. In May of 2018, Supports Planner Dwedeh Hne started working with Elouise. By that time, Elouise was unable to be left alone for any period of time due to wandering and leaving the home during episodes of hallucinations or delusions. 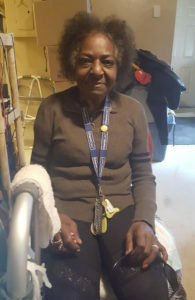 Dwedeh was able to work with providers in the area to obtain items that would allow for a safer home for Elouise including a shower chair, shower wand and a cane. Elouise’s family remained very supportive throughout this time. Dwedeh was able to assist Elouise with the approval of nineteen hours per week of attendant services in the home to help with her care. Elouise also receives five meals per week through the Home Delivery Service from Moveable Feast. Her sister-in-law, Gwen, was even willing to go through the process of becoming her professional caregiver. Gwen has been able help Elouise with dressing, preparing meals, bathing, housekeeping, medication management and is able to be present to ensure she will not wander from the home alone. Elouise is much more comfortable and safer in her home when her husband has to leave for work during the day. Dwedeh is now currently working with the Elouise and the family on her annual Plan of Service. The family has requested that Elouise perhaps look into changing her primary care doctor. Dwedeh was able to collaborate with the University of Maryland PACT team to help change her primary doctor. This involved talking with Andrew at the PACT team who was then able to identify a primary care physician who was closer to the Elouise’s home. This has been a positive change for Elouise and it takes significantly less time to travel to necessary appointments. Her husband is very thankful for the assistance that is being provided to his wife. He feels confident when he leaves home to work in the community that his wife is receiving the care that she needs and will remain safe. Elouise has shared with her family, as well as to her Supports Planner Dwedeh that she is happier and feels supported in her home.